Hyperhidrosis is annoying, but manageable with some planning. Excessive sweat friendly clothing is one of the many tools in your arsenal to manage your sweat. 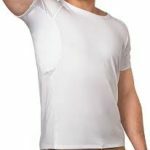 This post will tell you all you need to know about Sweat Proof Undershirt – one of the most effective options for managing excessive underarm sweat. Sweat Proof Undershirt – What is it? Let's start with basics. A sweat proof undershirt is essentially an undershirt that has special technology/construction to – a) prevent sweat from oozing to outer clothing and b) keep you cool so that you sweat less in first place. One of the common misconception about sweat proof undershirts is that they prevent you from sweating. Strictly speaking, that is not true – while the fabric and construction is usually designed to encourage breathability, the focus is more on “proofing” the undershirt so that the sweat does not enter the outer clothing to cause sweat stains. An important distinction, at least for this blog, needs to be made between sweat proof undershirts aimed at excessive sweat with advanced technology vs. more general purpose undershirts that are designed for breathability. 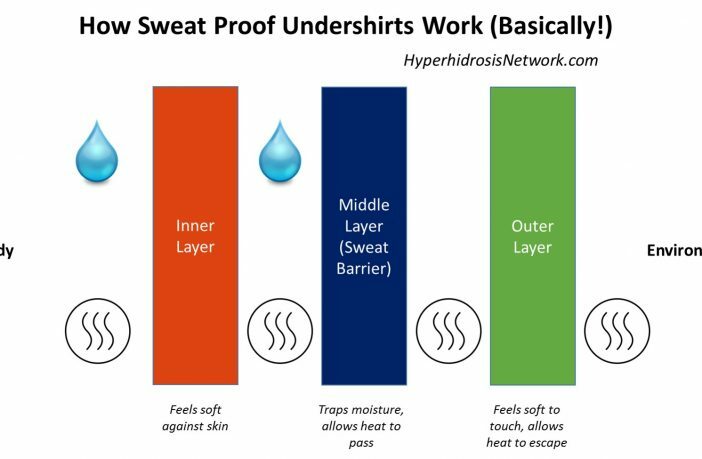 Some products market themselves as sweat-proof undershirt for hyperhidrosis patients while they are essentially a general purpose undershirt. How does Sweat Proof Undershirt help? As mentioned earlier, a Sweat Proof Undershirt keeps the sweat generated by body from getting to the outer clothing. This ensures that your shirts/dress etc do not show the ugly sweat marks. They also help avoid the yellow sweat stain that people with hyperhidrosis are only too familiar with. To be clear – sweat proof undershirt is not a treatment of hyperhidrosis. They will not cause you to sweat less, they will just help you manage the sweat better and live a normal life without the fear of sweat marks showing and damaging your pretty dress! How Do Sweat Proof Undershirt Work? 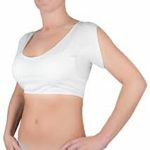 There are several products in the market that would qualify to be termed as Sweat Proof Undershirt for hyperhidrosis patients who sweat excessively in the underarm and upper body region. While almost all of them claim to have a unique (or patented) technology that makes them the best choice, most of them have pretty similar underlying technology. Breathable Fabric – A good Sweat Proof Undershirt is made up of breathable fabric. Most commonare cotton, and modal, but other fabrics can also be used. Sweat Barrier – the secret sauce is the sweat barrier in targeted areas (mostly underarm, but sometimes also on the back or everywhere). In the targeted area, the undershirt has 3 layers instead of 1 – the inner layer, the middle layer and the outer layer. While the inner layer and the outer layer are made up of standard material (e.g.cotton/modal), the middle layer is the “sweat barrier” that keeps the sweat in and does not allow it to escape to the outer layer. The material for the middle layer can also differ – but several manufacturers use bamboo fabric that also has antibacterial properties that keeps the odor in check. Sweat proof undershirts can be quite expensive – some can run as much as $30-$50 per undershirt as compared to sub $5 pricing for a normal undershirt. 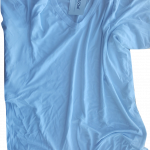 Most sweat proof undershirts target the underarm area – if your area of concern is different (e.g. back, or entire trunk), you need to select the undershirt which provides the sweat barrier for those areas. Sweat proof undershirts are bulkier than usual undershirts. Thats is not a big issue, but you need to be aware of that. Many users express surprise at how bulky they feel if they have not used them before. A Sweat Proof Undershirt should be reasonably expected to last a year or more depending on the usage intensity. However, you may extend the life (and ensure good performance) by taking good care. Do not use any bleach or any bleach byproducts in the detergent, as bleach can compromise the sweat proof layer rendering the shirt useless as sweat defence. Similarly, never dry clean your sweat proof undershirt dry cleaned. Just like bleach, the chemicals used in dry cleaning may compromise the sweat proof technology. Before wearing the shirt, apply a good antiperspirant – while not required, this will reduce the sweat production itself, ensuring that your sweat proof undershirt has to do less work to keep you looking fresh! When you take off the shirt, take care to keep it outside in to allow the inner fabric to breathe and get exposed to fresh air. As I said before, there are tons of companies providing sweat proof undershirts and it is often difficult to chose among them. The below table provides some of the leading brands in this space, along with key highlights. This should help you narrow the list. Some of these companies have provided generous discounts for HHN readers – so go ahead! Note: For ensuring like to like comparison, the prices indicated below are for White, V-Neck, Medium size shirt with micro-modal or similar premium fabric and are rounded off to nearest $ (accurate as of October 2017). PS: I recently wrote a comprehensive purchase guide for Sweat Proof Apparel as a guest blog post for ItsDri. 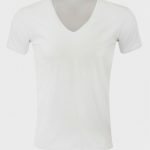 If you are in the market to buy sweat proof undershirt, this article may be super useful. Please note that while the article is hosted on ItsDri website, the content belongs to HHN and does not promote a specific brand. Did I miss any undershirt brand in the list above? Please drop in a comment.